As neuroradiologist Amit Saindane, MD, MBA, vice chair of clinical affairs, notes, patient-centered care requires accurate and timely imaging using imaging modalities such as radiography, fluoroscopy, ultrasound, computed tomography (CT), magnetic resonance imaging (MRI), or positron emission tomography (PET) to diagnose and plan treatment for everything from broken bones to heart disease and stroke. Care advances with image-guided treatment for conditions like vascular malformations and cancers. Nearly 80% of Emory Healthcare’s patients benefit from Emory Radiology’s expertise: the department completed more than 1.2 million imaging studies in 2017 at seven hospitals and dozens of clinics around metro Atlanta. Some divisions organize according to body systems and imaging modalities, while others utilize multispecialty, multimodality approaches. 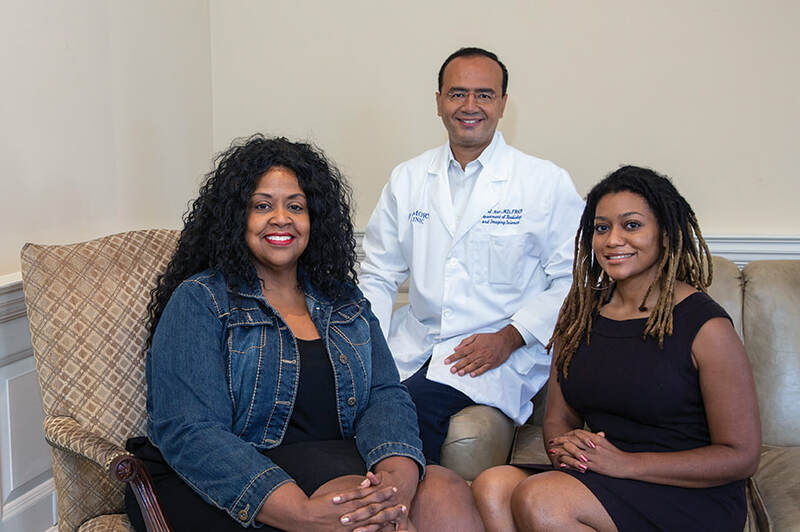 Thanks to interventional radiologist Dr. Sherif Nour (center), Avis Weaver (left) is cancer free. It's good news for her daughter, Shezza Shagarabi (right). Avis Weaver felt healthy, eager to take on the world after shedding over 100 pounds, earning a master's degree in social work, and making other important life changes. With a new lease on life, she opted for some plastic surgery. Shortly after, however, Avis felt a knife-like pain in her side. Her surgeon, Emory’s Angela Cheng, MD, ordered an ultrasound. A suspicious finding unrelated to the surgery was confirmed by subsequent MRI: renal cell carcinoma, an aggressive kidney cancer. Avis saw a string of specialists elsewhere. With the lesion in a difficult place, they recommended surgery with an incision made front to back. One wanted to remove the entire kidney. Another suggested partial nephrectomy but warned about post-surgery kidney failure. Both worried about traumatizing the liver. A third focused more on finances than treatment. All expected prolonged recovery with no guarantees. Four weeks after Avis’ initial diagnosis, Dr. Nour eradicated the cancerous lesion using laser ablation guided by magnetic resonance imaging with an open bore, 1.5T MRI machine. “Using MRI lets you see the lesion and its margins very clearly so you can precisely position the laser,” explains Dr. Nour. 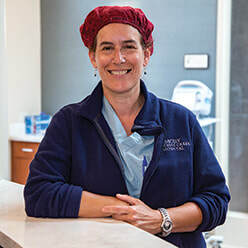 “MRI also lets you see temperature, so you can apply the laser with confidence and easily monitor ablation progress.” Avis went home that afternoon with a Band-Aid over a small incision in her back, her kidney intact. She took only ibuprofen at home and resumed normal activities in a few days. Three months later, she feels good, and her MRI and blood tests detect neither cancer nor reduced kidney function. Avis now is giving back as the newest member of the Radiology Patient-Family Advisory Council. The Radiology Observation Care Unit (ROCU) team at Emory Johns Creek Hospital (from left): staff RNs Mandi Erwin and Laura Austin, nurse practitioner Patrick Hickey, and staff nurse Walter Auker. APP physician assistant Hilary Karp delivers the highest quality patient care as an IR proceduralist. The Division of Community Radiology Specialists (CRS) brings Emory Radiology’s world-class imaging services to metro Atlanta’s suburbs. CRS serves the 110-bed Emory Johns Creek Hospital in northern Fulton County and the 410-bed Emory Saint Joseph’s Hospital in DeKalb County, as well as outpatient imaging centers in Cobb, Forsyth, and Henry counties. The division’s 12 radiologists routinely interpret imaging studies across a range of modalities and body systems. They also are specialists with advanced training in abdominal, cardiothoracic, neuro, and interventional radiology (IR), so patients with complex health conditions don’t have to travel far for cutting-edge imaging and image-guided procedures, says Howard Fleishon, MD, MMM, division director and chief of radiology services at Emory Johns Creek Hospital. CRS shoulders administrative and clinical leadership responsibilities at both hospitals. Daily Radiology team huddles focus everyone on patient safety and comfort and workflow efficiency. Referring physicians collaborate with CRS radiologists as part of a patient’s treatment planning. Patients also can talk directly with CRS radiologists about their findings. Emory’s CRS division is highly respected and emulated for integrating radiology professionals serving community hospitals with their peers in an academic medical center. CRS faculty have published and presented widely about their innovative multispecialty workflow and clinical practice models. For example, the new Radiology Observation Care Unit (ROCU) in Emory Johns Creek Hospital provides dedicated space for CRS radiologists, advanced practice providers (APPs), and technologists to guide complex interventional procedures using CT, ultrasound, and MRI to diagnose and treat a range of conditions. “Excellence in the ROCU is built on a collaborative, team approach to care,” says Dr. Fleishon. Curved computer workstations create a command center where team members collaboratively manage up to 20 procedures a day. Private rooms, easily visible and quickly accessible from that center, are fully equipped for monitoring patients before and after procedures. Team members work together, following strict protocols for patient safety while also making patients feel comfortable. Sometimes that’s as easy as playing a patient’s favorite music. Other times it requires more, as physician assistant and APP Hilary Karp knows. As an IR proceduralist in the ROCU, Hilary treats patients like Mr. P, whose liver was ravaged by autoimmune hepatitis. Every week for a year, ultrasound imaging helped Hilary guide a hollow needle into Mr. P’s abdomen to drain fluid accumulating due to liver failure without damaging nearby organs. Called paracentesis, it’s one of nearly 20 image-guided procedures Hilary performs. She also uses CT guidance to perform bone marrow biopsies and fluoroscopy to guide placement of IV ports and dialysis catheters. For Mr. P, weekly visits to the ROCU relieved more than pressure from the fluid. Dr. Krystal Archer-Arroyo is ensuring Emory Radiology can nimbly deploy technology and personnel across the Emory enterprise should a mass casualty event or other disaster strike. The Division of Emergency and Trauma Radiology deploys its subspecialty-trained radiologists to meet growing demand for both emergency department imaging services and STAT inpatient examinations at Emory University Hospital, Emory University Hospital Midtown, Wesley Woods, Emory University Orthopaedic & Spine Hospital, and Grady Memorial Hospital. It is led by Jamlik-Omari Johnson, MD, who also is chief of radiology at Emory Midtown. The division additionally plans Radiology’s response to mass casualty events. Imaging services are vital to an effective medical response to natural disasters, large-scale aviation or vehicular accidents, and even tragedies like mass- scale shootings. 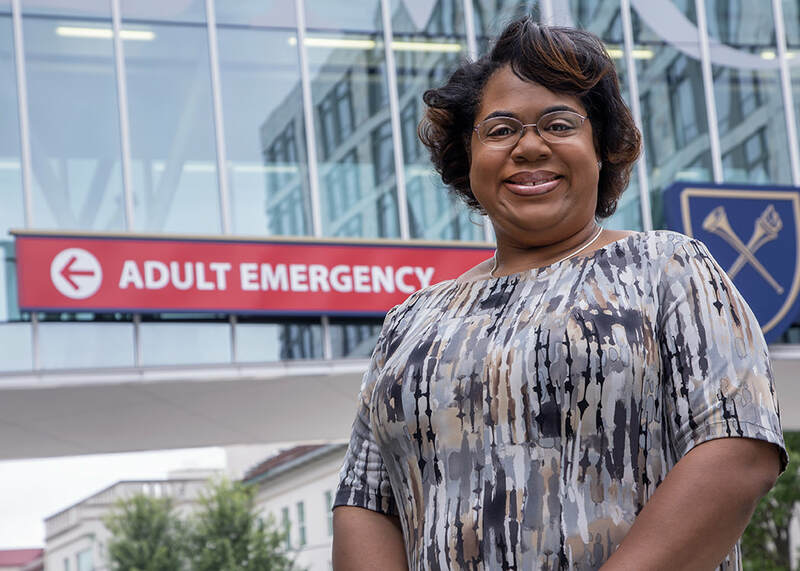 Enter Krystal Archer-Arroyo, MD, an emergency and trauma imaging specialist and director of Emory Radiology Critical Event Preparedness and Response. Since joining the Emory Radiology team in August 2017, Dr. Archer-Arroyo has visited every Emory hospital to assess Emory Radiology’s capacity for responding to catastrophic events. She has reviewed existing protocols and is drafting the department’s consolidated plan. That plan feeds and is informed by Emory’s Office of Critical Event Preparedness and Response (CEPAR), which leads Emory’s enterprise-wide planning for and coordinated response to catastrophic events affecting Emory and the broader community. Dr. Archer-Arroyo serves as a member of the CEPAR working group. Plans will be finalized by early 2019, and work will begin on department-wide training and capacity building activities, including drills like the Joint Crisis Exercise held in April 2018 involving Emory, the Centers for Disease Control and Prevention, and the Atlanta Urban Area Security Initiative. Dr. Archer-Arroyo’s work is ensuring Emory Radiology is well positioned to effectively deploy human and technology resources across the system when disaster strikes. 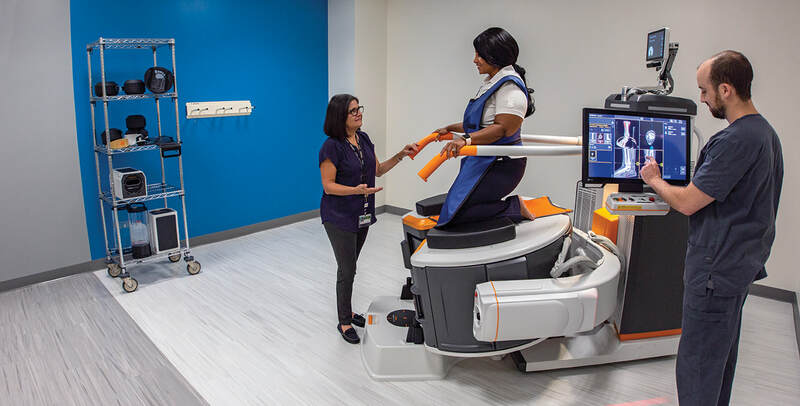 Musculoskeletal radiologist Dr. Monica Umpierrez, helps patient services coordinator Claudia Casserly-Hinds into the Carestream Cone Beam CT machine while imaging technologist Zach Conrad reviews scans. MSK radiologist Felix Gonzalez uses a model to note the location of a fibroma before treating a patient. Emory’s Division of Musculoskeletal Imaging (MSK) deals in bones, cartilage, and supporting soft tissue. Led by Monica Umpierrez, MD, MSK’s five radiologists and four MSK fellows provide diagnostic imaging interpretation across the Emory enterprise. They perform advanced imaging like ultrasound tendon elastography to diagnose tendon pathology, MR neurography to diagnose nerve injuries, and image-guided procedures (e.g., medication injections; aspiration of joint fluid; and biopsies of joints, tendon sheaths, bones, and soft tissues) employing fluoroscopy, ultrasound, and CT at Grady Memorial Hospital and Emory University Hospital Midtown. MSK radiologists collaborate with hospital physical medicine and rehabilitation (PM&R) physicians to review imaging studies and discuss approaches to care. Emory Radiology’s MSK and IR divisions are partners in the Emory Sarcoma Center of Winship Cancer Institute. Located at Emory University Hospital Midtown, the center is the largest in the Southeast. The MSK division also is a primary partner at the Emory Orthopaedics and Spine Center and the new Emory Sports Medicine Center, both at Executive Park. ​On the second floor of the Sports Medicine Center, which opened in late 2017, two x-ray suites neighbor the Siemens Magnetom Skyra 3T MRI suite, where 3-D imaging of joints and the spine enables precise diagnosis of complex conditions. A new Carestream Cone Beam CT produces 3-D images of weight-bearing studies to pinpoint defects impairing upper or lower extremity mobility. The low-dose CT features walk-in entry for significantly injured patients. 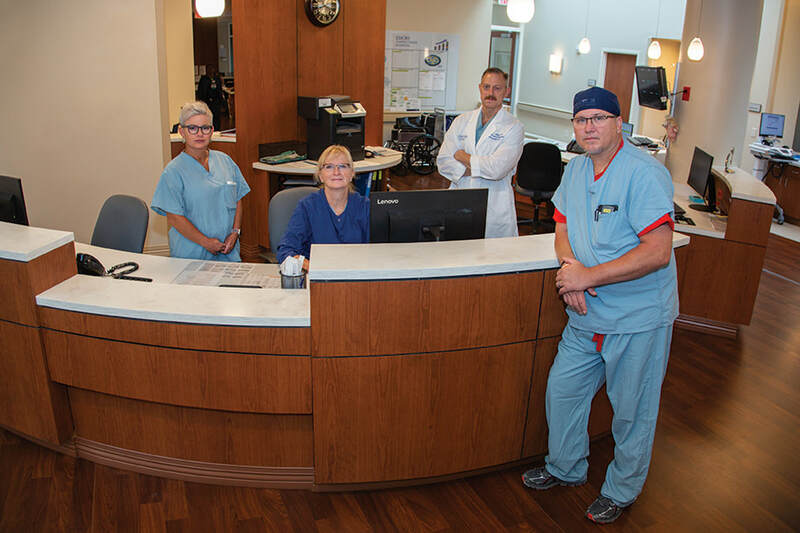 The radiology reading room is in the orthopaedic physicians’ work area and adjacent to patient exam rooms to facilitate a team approach to clinical decision-making and treatment. Making the facility truly remarkable is how it combines diagnostic imaging and clinical treatment resources with a professional sports training center for the Atlanta Hawks NBA team. The Hawks Nest boasts two full-sized practice courts, athletic performance training areas, a film room, and a recovery area offering cryotherapy, sensory deprivation tanks, and in-ground hydrotherapy. The Hawks Basketball Operations Team also is onsite. Emory Radiology’s MSK team joins Emory’s sports medicine team in providing diagnostic and treatment services in the facility for the Hawks, the Atlanta Dream WNBA team, the Atlanta Braves MLB team, the Atlanta Falcons NFL team, and Atlanta United MLS team. Weekend warriors, little sluggers, varsity stars, and daily pavement pounders now can go where the pros go and benefit from advances first pioneered to get elite athletes back in the game. “We’re democratizing excellence in performance and mobility,” says Felix Gonzalez, MD. After ankle-repair surgery, Amy Kuhn was supposed to wear supportive shoes to prevent arthritis. A fibroma, a benign mass between the instep’s skin and muscle, made arch supports uncomfortable. The orthopaedic surgeon referred her to Dr. Gonzalez, who used ultrasound imaging to guide steroid injections into the fibroma. Just two injections brought relief. Dr. Courtney Moreno and Dr. William Small offer CT colonography as a minimally invasive screening procedure to detect colon cancer and other abnormalities. A CT colonography image shows an 11 mm polyp that Dr. Small identified. It was confirmed by endoscopy to be a tubular adenoma. Colon cancer is highly treatable in its early stages, which is why routine screening is recommended and often covered by insurance for people over 50. Unfortunately, only about 60% of Americans are up to date for screening. A recent study found 1/3 of patients who underwent colorectal cancer treatment at Emory had never undergone screening prior to diagnosis; the average tumor size was 4.5 cm, which is difficult to treat. Many patients are intimidated by the invasive nature of colonoscopy plus the need for sedation, so Emory Radiology now offers another option: CT colonography, or “virtual colonoscopy.” Courtney Moreno, MD, associate professor of radiology and imaging sciences, says CT colonography is a good option for patients without symptoms and for patients who have been unable to undergo a complete colonoscopy because of their colon shape. The cleansing prep is gentler than for a colonoscopy, and no sedation is required. The technologist images the colon with the patient on their back and then on their side. The patient walks out a few minutes later and resumes regular activity. Indeed, data show CT colonography is better than barium enema for detecting polyps and other abnormalities. CT colonography now has an A-accepted rating by the U.S. Preventive Services Task Force, so it is covered by most insurance plans. 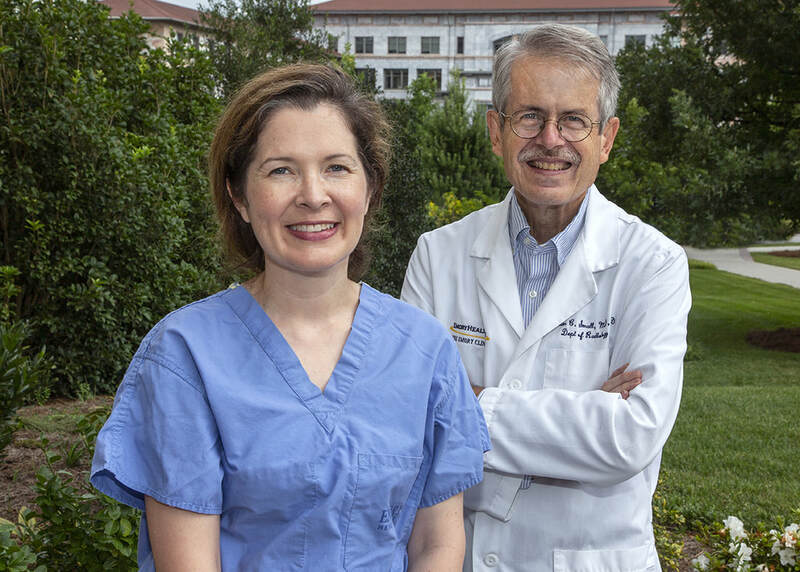 Last year, Dr. Moreno and Professor William Small, MD, PhD, completed 103 CT colonographies at Emory Saint Joseph’s Hospital and nine at Winship Cancer Institute. Interest in colonography is growing, so Dr. Moreno and Dr. Small are training radiology residents and fellows how to interpret a CT colonography.